I actually watched this movie months ago but I’m only getting around to writing the review now. This is mostly because I disliked the movie so much when I first saw it that I buried deep down into the recesses of my mind; somewhere between my infant habit of wetting the bed and that time a girl rejected me in front of all my friends. I actually wasn’t going to write this review at all but with the year coming to and end, I anticipated that this movie would be on my ‘Worst Movies of 2015’ list and, thus, I had no choice but to write it. 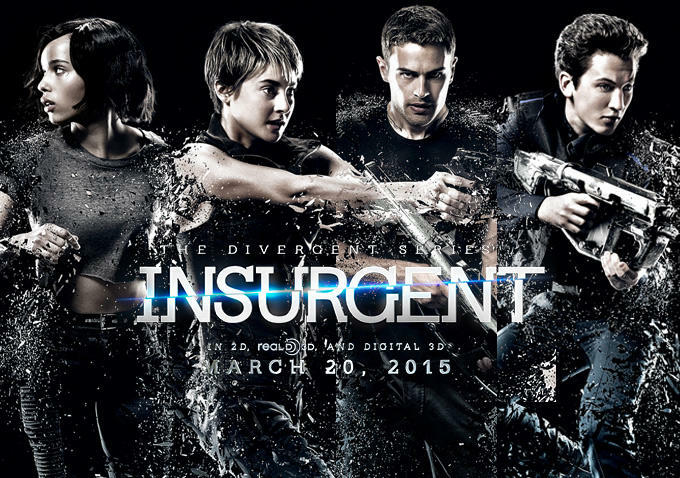 Okay, basic plot: Insurgent kicks off right after the end of Divergent – Tris, Four, Peter, Caleb and Marcus (Four’s father) are on the run from Jeanine and Erudite who know control Dauntless. 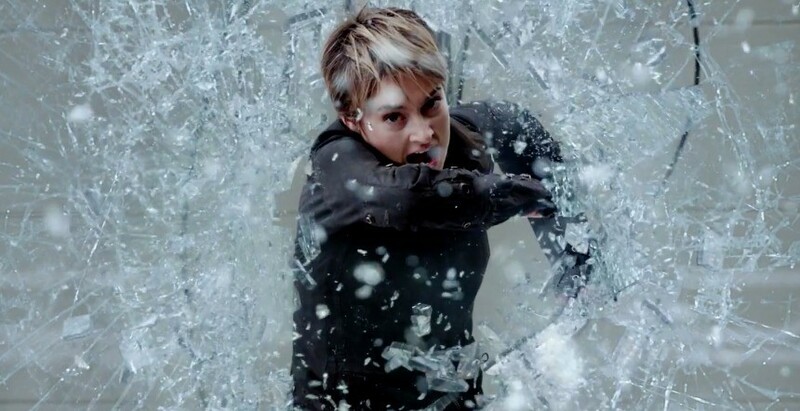 Tris discovers that Jeanine is hunting divergents in an attempt to open an ancient artefact that she believes will bring an end to the threat of divergents once and for all. Tris must now return to battle Jeanine and prevent the possible power the artefact contains from falling into her hands. I really didn’t like this movie. Everything that was wrong with Divergent is still a problem in Insurgent. It’s cliché, unoriginal, feels like a ripoff of other YA franchises and fails to offer you anything new from what you’ve seen before. So just as I was thinking this movie’s plot couldn’t get any more ridiculous than human beings only having one personality trait and being divided into groups based on these traits; the movie throws a curve ball that I just couldn’t process. You’ll remember from the first movie that people are tested through a series of simulations to determine their aptitude for the different factions. This made sense because it tested people’s reactions to various situations. In this movie, they’ve scrapped that test and replaced it with a hand-held scanner that determines what faction a person belongs to. WHAT? What’s the basis of that technology? How can a scanner determine my personality or how I’d react to certain situations? They were already pushing my suspension of disbelief but they pushed me over the edge with those personality scanners. Honestly, if you have technology that can do that, how is there any conflict in the world? I get the point of YA books and movies and I realise that I’m not their target market. This particular franchise is made for teenage girls. The number of strong, independent heroines in film is sorely lacking and I appreciate the idea of promoting stories with female leads to give young girls idols to look up to. Unfortunately, Tris Prios is not one of these strong heroines. Save for a fight scene here and there, Tris spends the majority of this movie either crying or waiting for someone to save her. I realise that the events of the previous movie have left her broken; but there is a difference between being a damsel who is distressed and a damsel in distress. The majority of Divergent was devoted to showing us Tris been trained mentally and physically to be a Dauntless soldier but she never feels tough, she never feels like a capable action hero. Shailene Woodley’s portrayal of her is better than in the last movie but it still isn’t competent. There’s a layer of complexity absent in this character and both Woodley and the screenwriter need to take fault for this. This movie’s plot is composed solely of cliches. There aren’t any moments that will surprise or thrill you. It’s boring! If you can’t provide originality, you have to provide a fun ride and this movie offers neither.I’m really coming down hard on this movie but it deserves it. Even if I think of Twilight (a YA franchise that I didn’t particularly like), it has traits that distinguish it. Even though some of these traits are horrible (sparkling vampires, WTF?) they are unique to Twilight and set it apart. Insugent like its sister, Divergent, before it has nothing special, nothing memorable. The only things I really enjoyed in this movie were Kate Winslet and Miles Teller’s acting. They do amazing jobs as this movie’s villains but are handcuffed by an unbelievably dull script.